Thank you so much for tuning into Overtake Motorsport for this live coverage of the Gles 2 Hours of Sepang powered by the EEC. We hope you have enjoyed our coverage and as the drivers are doing celebatory donuts we can wrap this up. Thank you so much, I’ve been Toby Burn and until next time – Goodbye for now. And that’s it! The Gles 2 hours of Sepang powered by EEC is complete! Kevin Siclari wins in spectacular fashion! Sansano comes home in 2nd ahead of Rob Timpen in 3rd. The clock has stopped! The drivers will now complete their laps. Siclari leads. Toby Howard receives a drive-through penalty – Cause unknown. Chachoglou makes an unexpected pitstop after car handling issues. Our timing is showing that Paulo Tempera has now retired from the session. Heart breaking for the Nissan driver to be so close! Barman, Bogar and Jones are all now battling for P4, Less than a second between them! Less than 10 minutes to go! Troy Barman retakes P4 and the battle resumes with just 13 minutes to go! Milan Bogar passes Troy Barman for P4. Timpen and Sansano battle into pitlane for what we assume is their final stops, Incredible that Siclari has managed to keep going despite taking less fuel. Sansano has come out of absolutely nowhere and is hustling Timpen and disrupting his plans of victory. O.6 separate 2nd and 3rd. 30 minutes remain in Sepang, Siclari currently leads Timpen by 5.0 seconds. Timpen mounting an assault of Personal best lap times to try and mount another challenge on the Porsche driver. van Dasselaar has done a stellar job, He’s climbed back into the lead and has now got a strong secure lead of 4.2 seconds ahead of Chachoglou who has recovered from his spin. Sansano secures third place ahead of Bogar after second round of pitstops, The former race leader now sits in 4th place 10 seconds off the podium places. Siclari on an aggressive stint, Punching in strong lap times and extending his lead to second to 5.4 seconds. Siclari responds and pits the very next lap, and it’s a much quicker stop than Timpen. Presumably alot less fuel was taken onboard. Expect a shorter stint for Siclari as we are just over half way into this event! Timpen pits, Attempting another undercut on Siclari for the lead. Jones moves up in to P2. Siclari right back up into the lead but Timpen refuses to let him go, 6 tenths separating the top 2! Incredible effort by Siclari and Timpen! They are still battling like crazy and dog fighting with 2 tenths of a second separating the duo! Augusto Maia has pulled into his pit garage in his Huracan and may just be facing a DNF, Hard luck. Jones, Sansano and Siclari all pit with Tempera not far behind. Overcut successful for Siclari, He now leads after the first round of pitstops. Siclari takes the lead – Timpen pits and rejoins in P6. More people beginning to make their stops now as we have 5 cars in pitlane, from both classes. Sansano is starting to close in on the leading pair as Milan Bogar drops to 6th position after a few bad laps. Less than half a second between the top two as they do battle in Sepang! Traffic is already coming into play in this event just 20 minutes in. Siclari makes the move for 2nd place, Top 3 separated by just 1.4 seconds! Timpen takes the lead after making a move on Bogar. Kevin Siclari is now trying to follow suit for second. First pit-stop of the day comes from Pala from the Boxer class in a very early strategy, he feeds back out directly in-front of the leaders and is shown the blue flag. As things begin to settle down Toby Howard’s woes fail to improve with him being 16 seconds behind the final car of the boxer class, awful start for the Aston Martin. Timpen passes Sansano for Second and Siclari is able to sneak by for third. A spin for Chachoglou see’s him not lose a place but lose a huge amount of time to 13th position. More drama for Siclari as he slips down to 4th place after Sansano’s move for second allows Timpen in the Mercedes to sneak through on the early stages of the 2 hour event. Milan Bogar has taken an early lead after passing multiple cars on the first lap in his Bentley. He is ahead of Siclari and Sansano, leading the boxer class is Chachoglou after a bad start for van Dasselaar see’s him in third. 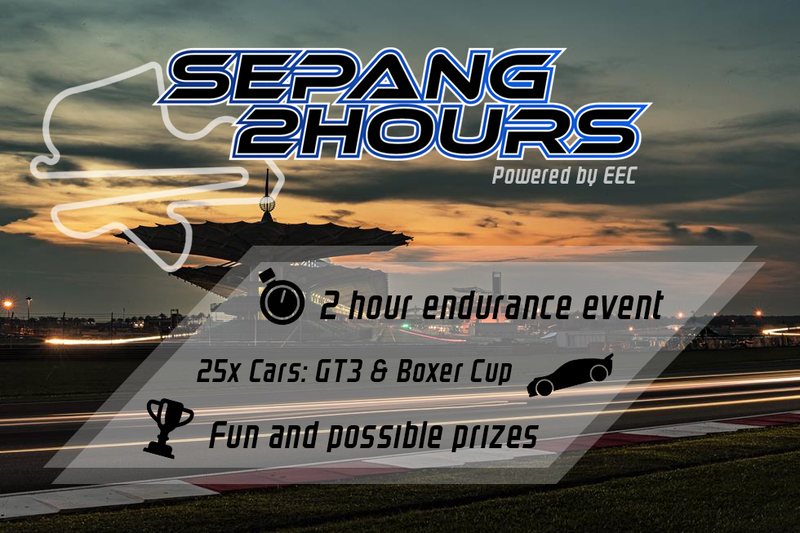 We are LIGHTS OUT for the Gles 2 hours of Sepang powered by EEC! We understand that there is a small delay until the race start, Although we will be live blogging the moment the cars enter the race session. Please stand by! Something to note is that Toby Howard in the Aston Martin qualified not only last of his class, but last overall too. He will have to try clear the Boxer’s as soon as possible. Luckily for him he has 2 hours to rectify whatever issue stuck him at the back of the grid. Qualifying has come to a close and Kevin Siclari confirms his pole position time in his Porsche 991 – 3 tenths clear of Sansano in the Mercedes. van Dasselaar takes the Boxer pole from Reinhard Berger. Full results available after the event has concluded for those who want to look things over just that little bit further! The drivers are now in warmup and in 5 minutes we will be ready to go green! Sansano moves within 2 tenths of Siclari but it’s not enough to take the top spot. A close battle for second is apparent with just a tenth separating Sansano and Timpen, Both piloting a Mercedes AMG. The trend continues with Van Dasselaar setting the fastest time in the Boxer class – but only -0.064 ahead of Chachoglou! Kevin Siclari ended practice with the fastest time and he looks to continue that trend by setting the provisional pole position overall in his Porsche with a 1:56.669 – An incredible 8 tenths ahead of his closest competitor Sansano. Qualifying is just beginning, Drivers from both classes will have to share the track for 25 minutes to decide their starting position for the 2 hour endurance race, Traffic will surely be an issue so drivers will have to play it smart in their positioning. We are now up to 21 drivers on circuit as the tension begins to rise and the countdown until lights out really starts to kick in. We now have an established fastest time in the Boxer class in the form of Jorrit van Dasselaar with a 2:05.019. Just under 10 seconds of the GT3 lead. Hello everyone and welcome along to the Overtake Motorsport coverage of the Glês 2 hours of Sepang powered by the EEC. We will be covering all the action here via our live blog, So sit down and get comfortable because you won’t want to miss any of it! The cars are currently out in Free Practice and running their own respective programmes with Troy Barman’s Audi currently sitting fastest with a 1:58.974.